A common question asked to geographers is "what exactly do you do?" That, unfortunately, is not as easy to answer as one may think because geographers work on a variety of disparate topics. One of the my main topics of interest is climatology. Climatology inherently involves many spatial and temporal components that include determining short-term and long-term trends, identifying spatio-temporal anomalies, analyzing past, current, and future changes, and relaying how trends, patterns, and changes may actually play out on the landscape. Below you will find a few short sections describing some of the climatology-centric projects that I have worked on over the years. Projects that appear in other sections may also have a climatology element - alluding to the interdisciplinary nature of geography. 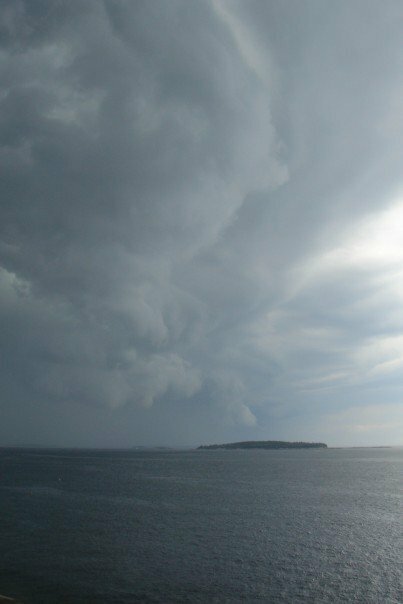 The picture to the right shows a fierce thunderstorm rolling across Boothbay Harbor, Maine (as viewed from Damariscove Island). 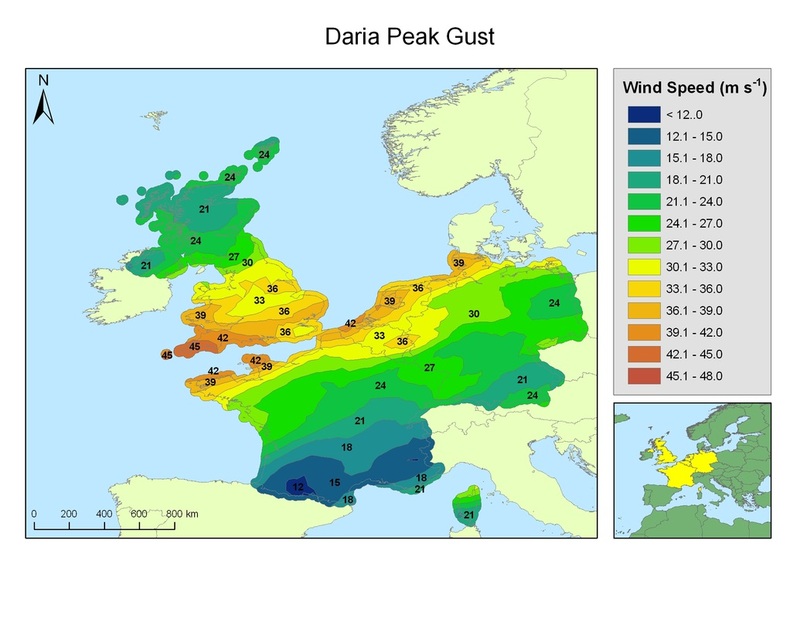 A form of stochastic spatial interpolation known as ordinary kriging was used to estimate wind speed surfaces (max sustained and peak gust) for 18 different windstorms that have impacted Europe since 1978. An anisotropic semivariogram was applied to the model to account for wind directionality and the peak gust wind speeds for the windstorm Daria are shown on the left (click to view a larger picture). This is part of a white paper produced in conjunction with ImageCat, Inc. for Guy Carpenter Insurance Company. This completed study was the first of three components from my dissertation. The second component improved the initial models by utilizing a technique called cokriging where up to three covariates were used to aid the model in estimating surface wind speeds. The third component examined variation in interpolated wind surfaces based on scale by modeling specific storms that impacted the topographically diverse country of Austria. Tree damage data were also utilized for validation purposes. Products include two publications in Spatial Statistics and Geomatics, Natural Hazards and Risk. According to some of my ongoing research, climatic patterns are often associated with risks of infectious disease outbreaks in human and animal populations. These relationships suggest that mechanisms that influence weather could potentially be used to forecast outbreaks of specific diseases. Most diseases have a distinct seasonal pattern (e.g., plague, typhus, yellow fever, malaria, dengue fever, anthrax, and tularemia) and are often influenced by teleconnections such as the El Niño-Southern Oscillation (ENSO), North Atlantic Oscillation (NAO), and/or other powerful atmospheric mechanisms. 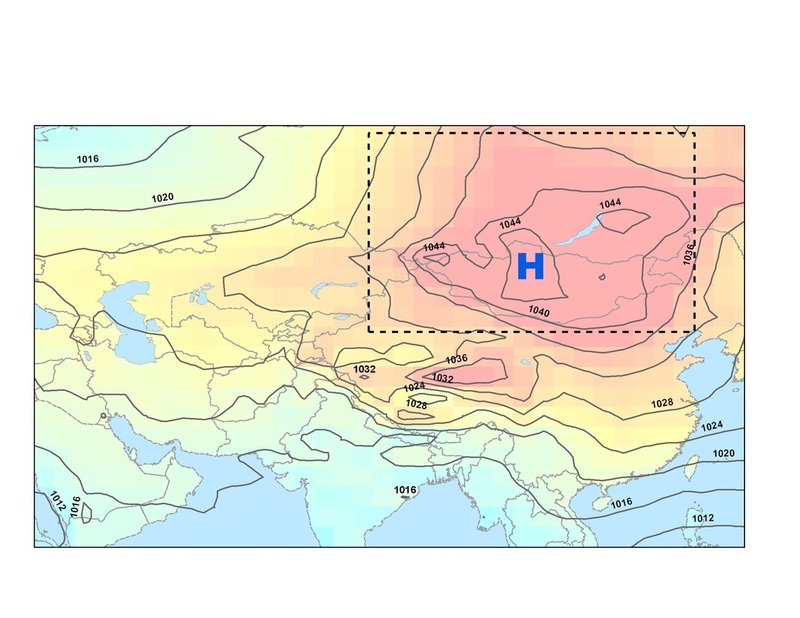 In central Asia, anthrax outbreaks occur predominantly in the late spring, summer, and early fall, but the winter-time Siberian high (shown in the adjacent map) has a major influence on the outbreaks according to a step-wise multiple linear regression. Tularemia outbreaks in Sweden were also significantly influenced primarily by two teleconnections: the East Asia/West Russia Oscillation and the Polar/Eurasian Oscillation. My research continues to evolve in the area of climate-health relationships, but it is very interesting to see the potential predictive ability of some teleconnections for outbreak potential. I have always been intrigued by tropical cyclones and I experienced Hurricane Katrina firsthand as an undergraduate student at LSU. This experience, along with my interest in the topic caused me to pursue this avenue of research for my undergraduate honors thesis. The maps on the left show the kernel density estimates of all hurricanes (a), category 1 hurricanes (b), category 2 hurricanes (c), category 3 hurricanes (d), category 4 hurricanes (e), and category 5 hurricanes (f). I also analyzed decadal centroid patterns dating back to the 1940s utilizing centrographic statistics. Overall, location of peak frequency varies by tropical cyclone category, with stronger storms being more concentrated in narrow regions of the southern Caribbean Sea and Gulf of Mexico, while weaker storms occur in a much larger area that encompasses much of the Caribbean Sea, Gulf of Mexico, and Atlantic Ocean off of the east coast of the United States. The results of this research evolved into one of my first publications which can be found here. My interest in tropical cyclones continues to this day because they have many of the same characteristics as mid-latitude cyclones (including the aforementioned windstorms) and they impact a large proportion of the human population. Coastal areas around the world are susceptible to cyclones (mid-latitude and tropical) and these same areas also contain a disproportionate (and increasing) percentage of the global population.